A must for local businesses. Local-search visibility vs. SEO: Does your provider know the difference? If your customers are in your neighborhood rather than nationwide, local SEO is essential to a successful marketing strategy. This is especially important if your local market is saturated with similar competitors. With search engines putting greater emphasis on delivering local results to users’ queries, it’s a given that competitors with a complete local SEO plan in place will be found first. Why work with us on local SEO? SEO tactics come and go. Instead of spending your budget chasing Google’s latest algorithm, however, we build your local SEO campaign on solid marketing strategies. Our focus on the factors that truly matter helps create local visibility that endures and positions you for natural rankings growth over time. The local SEO campaign we create for you involves work in several areas. You can’t focus on a single aspect of local search and hope to do well. 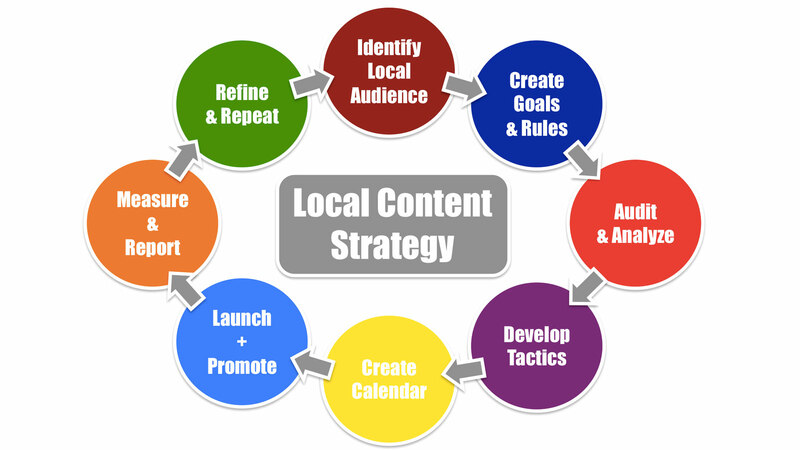 Instead, you need a complete local strategy that covers all aspects of your local online marketing. We have spent years perfecting what works and what doesn’t so that you can get sound services and sound advice. There are no miracles, no instant rankings, just hard and focused work that is built to last. Keyword research to determine how people look for your business. Onsite optimization that provides special local signals to the search engines. Online citation development to establish accurate business information in online directories. Review strategies to promote your business. Local link development to capitalize on your business relationships. Google is still your most important local marketing channel. We’ll make it work for you. We think everything is content. Pictures, words, links, local citation listings, videos, and even your physical location. It all tells a story and leads people to your business. Our services center around improving and promoting your content in all of its various forms. The cycle below is the process we follow to do so month after month. It never stops working. Whether you’re new to local SEO, have spent too much already without results, or just want to work with people you can trust to have your best business interests at the heart of all they do for you, we’d love to talk with you. Why Work with Bluehive Interactive? How much does your local SEO services cost? Our pricing is based on project size. We work with small businesses to big brands with 1000’s of locations and find that packages don’t work well. Generally, for continual work we have a minimum budget of $1500 per month. We work with lawyers, furniture stores, medical professionals, insurance companies, storage units, plumbers, electricians, and other very random industries. We are always up for a challenge and many principles are universal in local search. We like to work with good people. That is our major determining factor. Rankings do not equal return on investment. While we track rankings, the main things we focus on are website traffic, phone calls, form fill, and sales. Generally speaking, when we start working on a website overall rankings begin to improve within 1-3 months. As more content is built, you have more phrases that bring people to your website. We rarely worry about a single keyword but look at the data and impression reach all the time to ensure it is improving. With maps specifically, ranking can be based on location, search terms, mobile vs desktop, and other factors. Yes. Generally, this is for big brands that are looking for a premium service. Do you do á la carte work? Yes. Link building, content creation, and citation work are all areas where we can provide focused project work. We do like to know your bases are covered in other areas as focusing on one thing will never win the prize when compared to a strategic approach to local search marketing.